"Our mission is to inspire teachers by sharing global stories, equip teachers with skills and techniques to implement in the classroom, and enrich teachers by building a global community of educators." 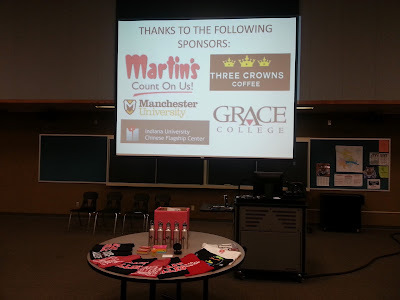 Our wonderful sponsors & the door prizes. 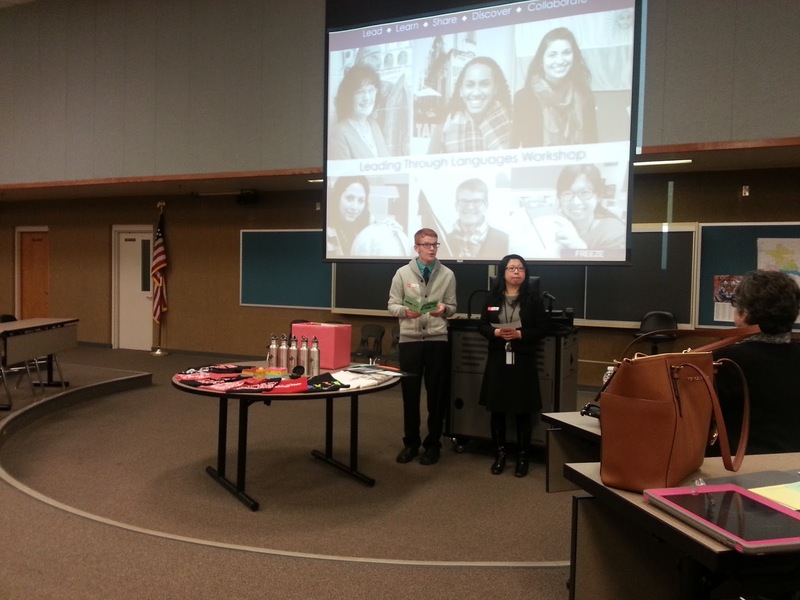 Mr. Hindsley & Dr. Tseng introducing the day. It was obvious that the day was going to be well spent when I received an email that I could go at 8:30am if I wanted coffee and pastries. Most teachers might shy away from earlier Saturday mornings, but for a stay at home mom with a Hubby on baby duty: Get me there as early as you want and get me some caffeine! Sounded glorious. I immediately got the chance to connect with friends and colleagues that I haven't seen much of this school year. It was so good to catch up with them and get a chance to "relax" with them throughout the day. I was very impressed with the turnout that the workshop had: administrators, music teachers, history teachers, language arts teachers, college students, stay at home moms, media center specialists and world language teachers were ALL present for this day of intentional learning. We registered, received a folder from Manchester University stuffed with a notebook, a feedback form, a school map and the breakout session offerings and descriptions. 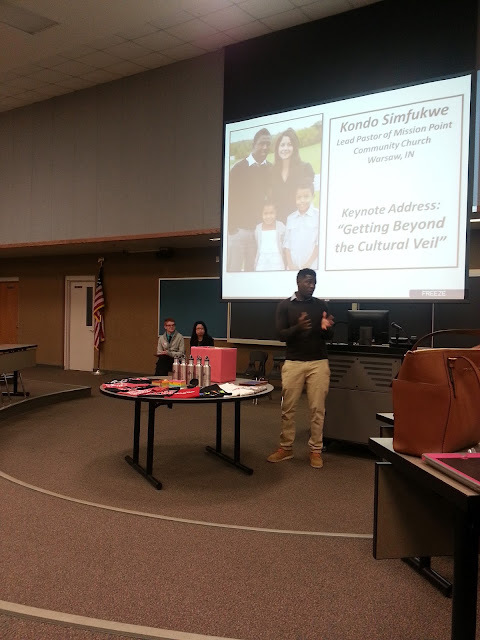 A few minutes after nine, the keynote speaker Kondo Simfukwe was introduced. "I had a very low self-concept. But I wasn't disinterested." He explained that he felt fortunate simply to have the opportunity of an education, and would regularly claim he understood when questioned, rather than make the entire class stop for just him. "I am completely people focused. But, that doesn't make me lazy." Project deadlines were difficult for him to meet because he valued conversations and relationships over all else. "I am community-oriented. So, I'm not motivated by grades or GPA." Teachers tried to hold grades or class rank over him, when in reality no one tapped into his true motivation: how he was impacting the entire class. Kondo challenged me to see behaviors (especially those of middle school students) as less of fully informed, intentional decisions and more as a product of their cultural experiences. 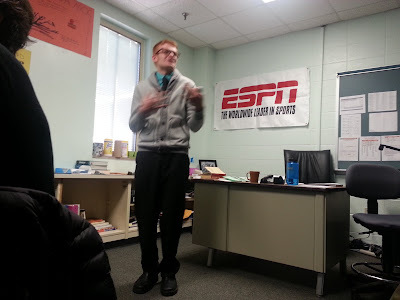 He reminded me that my students might not even be able to perfectly articulate their cultural understandings: "By the way, that's not how culture works. I don't go around saying 'this is my culture and I experience it sequentially in this way'...it's just who I am." Kondo made me want to be more curious and observant of my students' lives and hear more of their personal stories that undoubtedly impact their daily life in my classroom. From there, we went to four different breakout sessions. Some were an hour long, but most were half an hour. I chose to attend Christopher's first session: Connecting Cultures; A French & American Exchange Program. He talked about the program he has helped to grow between a French high school and Warsaw which involves a three year rotation of a student exchange for two years followed by a group exchange the third year. 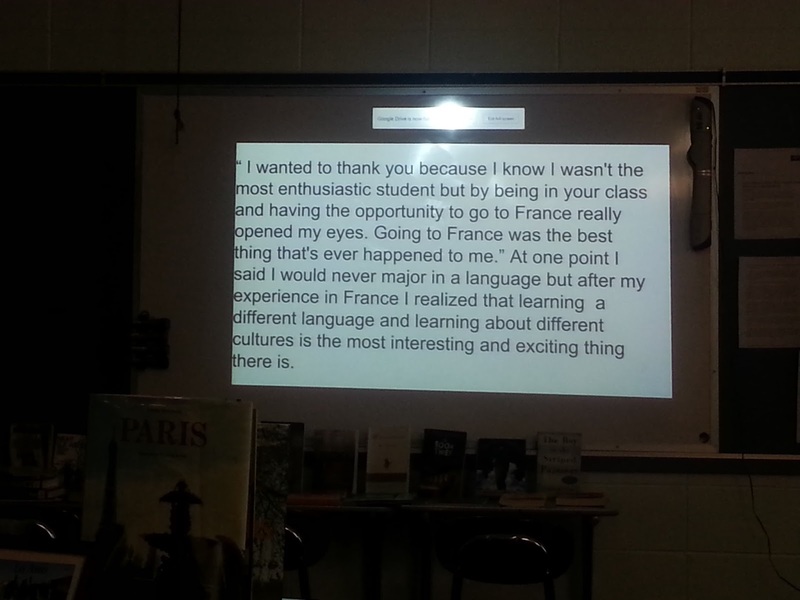 My favorite part of this program is that it is a true exchange: each year the French student(s) come to Warsaw in the fall (six weeks as an individual or 10 days as a group) and each spring our students go to France for the same amount of time. Christopher really inspired me dream about what a Spanish exchange program in Warsaw could look like. I started envisioning a two country program one day where we could send students to Ecuador one year and Costa Rica the next and then our group trip could alternate between the two. I think this would so highlight the cultural differences, accents and country specific vocabulary that we can't properly cover in our classrooms. 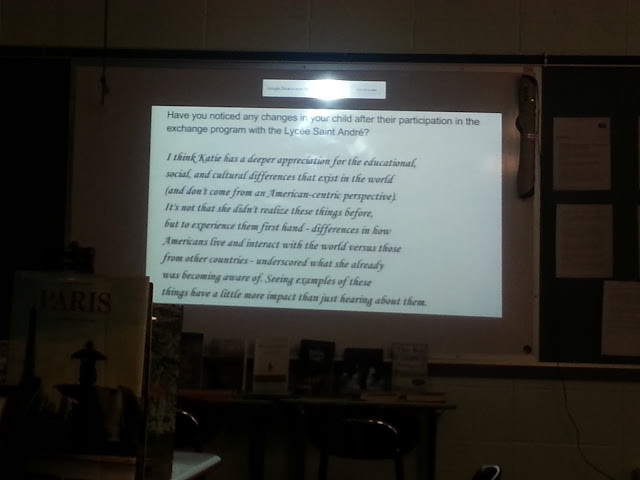 A formerly un-motivated student's words about the exchange program and its impact on her. A parent's words about how the program impacted her child. Christopher reminded me that "our job is to infuse their day with culture, even if they can't get their passport or fly across the ocean." Next, I attended Harrison Elementary teacher Deb McClintock & Harrison Elementary Principal Lee Snider's session: Sister School Partnerships. I had worked in Warsaw during the process they were presenting, but I was completely unaware of all that they had accomplished! 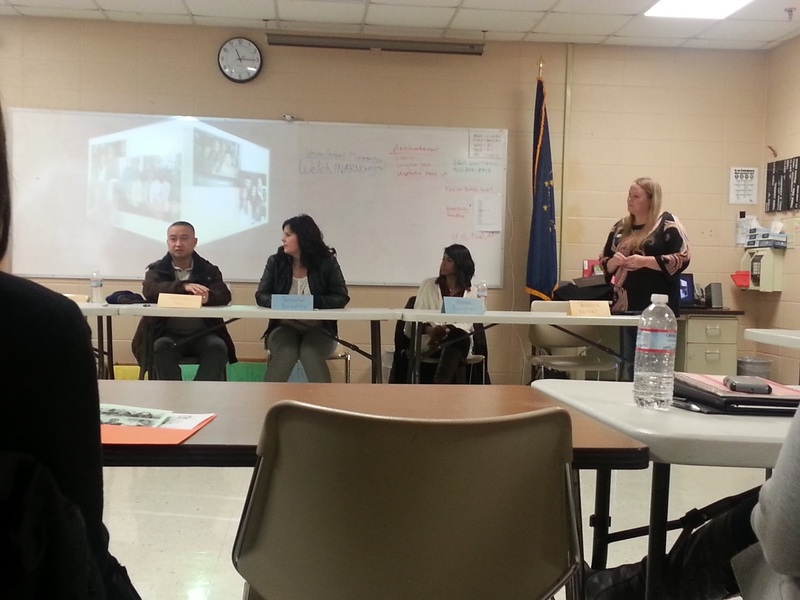 Deb described how she had been intrigued by Asian cultures as a young child, and saw an opportunity to get paired with a Sister School in China thanks to a program called Global Indiana. 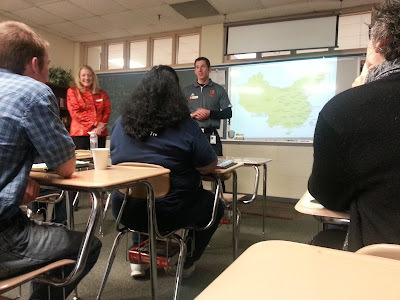 She even got to visit the school, which happened to be in a prestigious resort community in China. Lee then informed us of the logistics of scheduling the Principal of their Sister School's visit and planning a group visit for Chinese students to Warsaw as well. It was fascinating to hear how a group of elementary aged Chinese students came to our small town in Indiana, stayed with host families in the area, attended classes at Harrison and tried to live the life of our students. I got emotional (not the first time during the workshop) hearing how not only our students were impacted, but also their parents and siblings as well by getting to know people from across the world. The difference between this program and the exchange program was that none of our Warsaw students have thus far visited China, but that is still a dream in process. I am so excited to hear how this program continues to grow! Lee's quote really struck me when he said, "Regardless of what our students later hear in the media, they can be grounded by knowing they have a friend in China who is a good person." And Deb's dream deeply resonated with me when she said, "I want our students to have early exposure to other cultures so that their 'little antennas' are up and we can help make the world a smaller place." Deb (in red) and Lee (center) were a great team. "If you see something extreme or inappropriate, contact parents right away." Many parents highlighted how the family may be trying to intentionally work on a behavior issue at home, and although it may not appear to be worthy of parent phone call home, always over communicate. These parents have years of teaching and communicating to make up for and they need all the 'head's up' they can get. "Just because he's speaking English well, don't assume he can read at that level." As a language teacher I feel like I should not have been so surprised by this one, because we all know that different aspects of language develop differently. However, it struck me as such a delicate matter when the student could potentially be so well incorporated socially, and yet be quite behind academically. It also really convicted me as a language teacher that the students who do the best assimilating to our country are the one's whose verbal skills develop quickest. Why is it that in so many of our classrooms the verbal skills are the ones that we sacrifice so that our students can 'master' accents and reflexive pronouns? "In groups, put him with the higher functioning kids so he can model both their behavior and their language." Sometimes this is counter-intuitive. And different groupings serve different purposes. However, there are definite times when international students or ESL students could benefit from being placed in a group perhaps they are not "ready" for. The panelists sharing with us about their family's varied experiences in our schools. We rounded out the day by returning for door prizes and a final word from the committee. One of the questions (that, in my opinion should be on EVERY conference evaluation form!) was "what session would you like to see offered in the future?" It was fun to brainstorm about different colleagues I know who could offer wisdom in this setting, and even dream about what I might have to say one day. It intrigued and frustrated me that the conference claimed to highlight languages, but in an effort to include teachers from many content areas it ended up focusing almost entirely on cultures (valid, and extremely important, mind you). My biggest hope for the future of Leading Through Languages is that we find a specific way to incorporate language development, language reference, and language pedagogy specific sessions. All in all it was an INCREDIBLE first workshop. I came home eager to talk my husband's ear off about all that I had learned and organize my four pages of handwritten notes, quotes and ideas. This one will definitely be on my calendar for future years and I can't wait to see how it grows. On Twitter, many educators tweeted pictures, quotes and reflections under our previously established corporation wide hashtag: #WCSmission.